Like most observing nights, the teenagers came to visit. The hole in the tropical sky held long enough for a window to Saturn and Mars. Three boys and a couple girls grew to a dozen or so. A staff member sent her daughter. The old 8 inch telescope shows wear but it works. So, plain old eyepieces and a Barlow got us enough resolution to get them excited to see Saturn’s rings. Mars was bright, too. Here and there I would comment about the wonder of it all. Then the clouds picked up so we ran to the moon, where I had intended to draw a crater. Any crater would do, because observing times like this keep me talking and lining up folks to see the sights. I rarely have time to sketch, so this was a rare night. It quieted down when I pulled out a tiny sketch kit with a piece of 6×9 black paper, 3 pencils, and an eraser. It happens every time I sketch — they always seem really interested in how observing gets recorded. I explained the moon map, how you find where you are, gave them a chance to find Plato in my field of view, and started the outline. They all stayed to the end, so I explained what goes on an observing sheet and how they could learn the process themselves the next time we had the chance to look skyward. I often have to sacrifice sketch time and quality because the dialogue makes things a bit busy. The moon, of course, is that perfect monthly timepiece and close enough to provide a God-created night light that runs on solar power. It was just past quarter moon, so the Crater Plato showed up very nicely. They learned about the terminator, light direction on lunar surface, and why we always include some Bible verse on the observing sheet. After all, He made the heavenly body. It was a good night to give thanks. On a wider note, most the young people on the compound are fatherless. 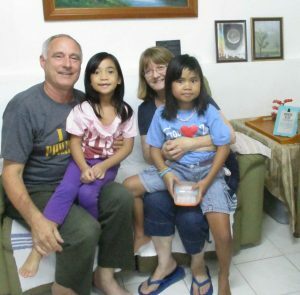 Faylene and I regularly hug some of the little ones. A couple young ones come to draw quite often, but they really stay when we are engaged with them. The older ones are the same. They like to be engaged in conversation and many visit our quarters sooner or later. We love them all and don’t mind being parents or grandparents when it’s needed. It’s often needed. Observing a few times a month is not just observing. It’s relating the love of God, who is Father of the fatherless, to those we love. 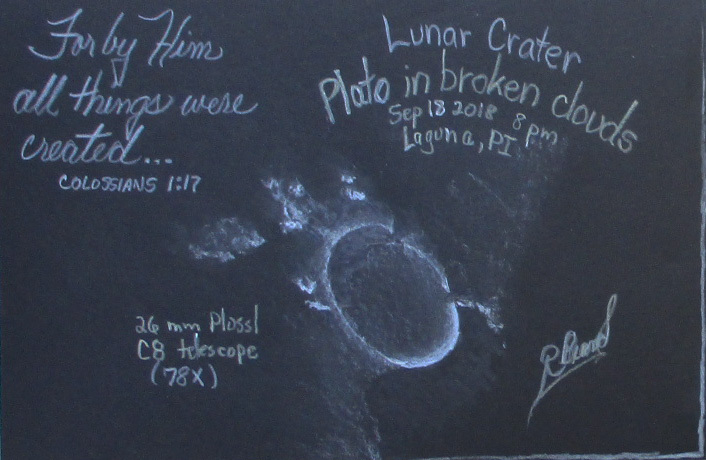 Tagged Bible, children, christian astronomy, inspiration, love, moon, Philippines. Praying many blessings as you minister to those God places in your path as you journey this earth. May He continue to open a clearing in the clouds each time you gather to view His wonder and majesty. Give you both discernment and wisdom as you share His love with all. Sending much love and prayers. How many children around the world are hungering for love. And how many adults need God’s love too. Thank you for reflecting Him as you observe His Creation.